I want to talk about the so-called “rabbit ears”, which is one of the most enduring concepts in organic chemistry. There have been several exciting discussions related to this topic at the American Peptide Society meeting this week. By way of background, Professors Ron Raines and Dek Woolfson published a thought-provoking paper back in 2010, in which they analyzed the pdb (protein database) and came up with a conclusion that nearby amino acid residues in proteins display n-pi* interaction. I discussed this back in 2013 (https://amphoteros.com/2013/11/27/neighbourly-ties/). According to the Raines/Woolfson analysis, the molecular orbital-based view of the amide oxygen is more adequately described not as A (below), but as B, in which there is a p-like molecular orbital perpendicular to the C-O vector. The authors stated: “Contrary to the expectations of valence shell electron pair repulsion (VSEPR) theory, the two lone pairs of divalent oxygen do not occupy equivalent orbitals that resemble rabbit ears”. While “B” adequately explains the interaction between adjacent amides seen by Raines and Woolfson, it does not (in my view) provide grounds for saying that the good old rabbit ears concept has no merit. However, this is exactly what some people tend to conclude from their work. What might be done in defense of the poor old rabbit ears? I suppose if there were a study clearly demonstrating the 120o (or so) angle formed upon Lewis acid coordination to oxygen, it would be convincing enough. There is indeed a paper that shows that: Corey’s 1992 report in Tetrahedron Letters exemplifies the 120o B-O-C angle both in X-ray and in solution. I am somewhat relieved that the good old VSEPR model is alive and well. There is some really nice cycloaddition chemistry coming out of Prof. Rob Britton’s lab at SFU. I just heard Rob speak at the symposium dedicated to the memory of Alan Katritzy. Alan’s passing was a big loss to the community, which is evidenced by the interest his chemistry keeps generating. The chair of our Department, Prof. Rob Batey, together with Prof. Vic Snieckus of Queens University, put together a nice group of speakers to commemorate Alan’s contributions to the science of heterocyclic chemistry. All of this took place in Ottawa, as part of the annual CSC meeting. Now back to the [4+2] chemistry, which is appropriately (according to Rob Britton), referred to as the Kondrat’eva reaction. 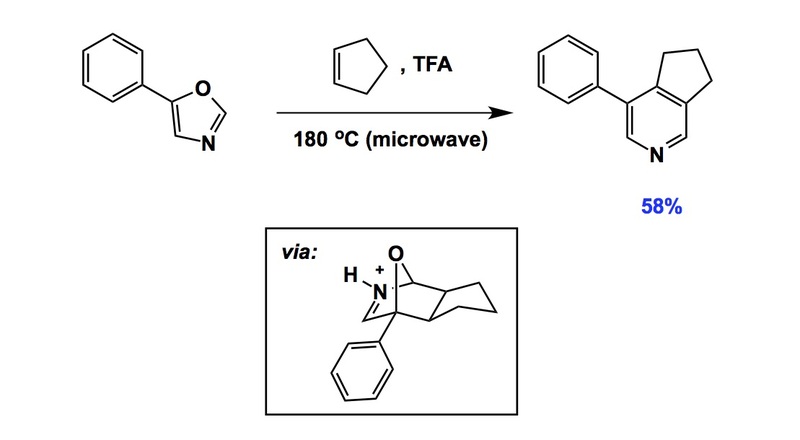 It is an interesting process, mainly due to the rare display of cycloaddition behaviour on behalf of the oxazole nucleus. Rob is running these reactions in flow, which makes sense given the volatility of alkene starting materials he uses. The reaction is a wonderful means to put together substituted pyridine rings. If you look at the ones made by Rob, you will see that it is far from obvious how to make them by any other means. In the hands of the SFU team, this chemistry was applied towards the synthesis of bioactive molecules. I just came back from upstate New York, where I participated in the Northeast Regional Meeting of the ACS. The symposium I engaged in was superbly organized by Professor Anna Larsen of Ithaca College. This meeting gave me a chance to take a picturesque car ride from Toronto through the bucolic settings of upstate New York. These kinds of events are special because the audience is inevitably small, yet there is ample opportunity to see old friends and socialize with people you have not met. Peter Wipf (Pittsburgh), Scott Miller (Yale), Vladimir Gevorgyan (UIC), Amy Howell (Connecticut) and Alison Frontier (Rochester) made for a nice getaway from the daily routine. I want to comment on something I wrote in my notes during the talk by Vladimir Gevorgyan. He made an interesting statement that an allene ketone of the type shown below (A) needs very “little” in order to get transformed into a furan. 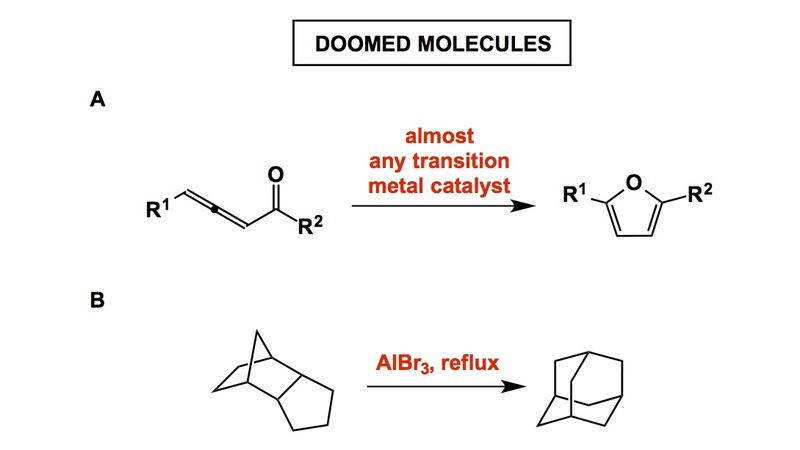 It appears that almost any metal catalyst is capable of inducing this transformation. Depending on the catalyst, the corresponding reaction might proceed by a unique mechanism, but the result in the same. I was really glad to learn about this phenomenon as it reminded me of my long-standing fascination with the “doomed” status of some molecules. This brings to mind the fundamental studies by Paul Schleyer. Back in the 1950s, he worked on the synthesis of adamantane and published an influential single-author JACS paper in which he described the transformation of the tricyclic hydrocarbon shown below into adamantane (see B). This work was followed by a number of papers from Paul’s lab, all pointing out different structures that somehow converged onto the adamantane nucleus when subjected to strong acid. The paths were different, but they had something in common: the involvement of cationic intermediates. Regardless of the specific chemistry, there are similar features in all transformations of what I call doomed molecules. The occurrence of reactions that bring a variety of structures to the same outcome is an interesting phenomenon and our appreciation of such pathways might be a sharpening stone against papers that are presumably innovative, yet correspond to inevitable outcomes driven by some strong forces. 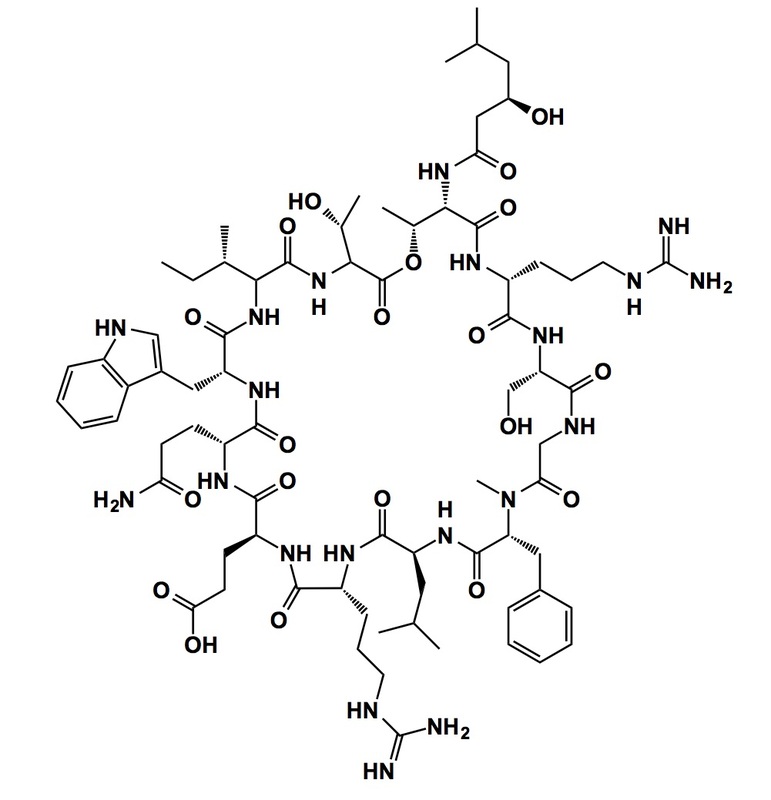 Griselimycin (GM) is a cyclic peptide from one of the Streptomyces strains. The molecule has been known since the 1960s. A research program, initiated at Rhône-Poulenc in those early days, was shelved in the 1970s due to the short plasma elimination half-life of GM upon oral administration. 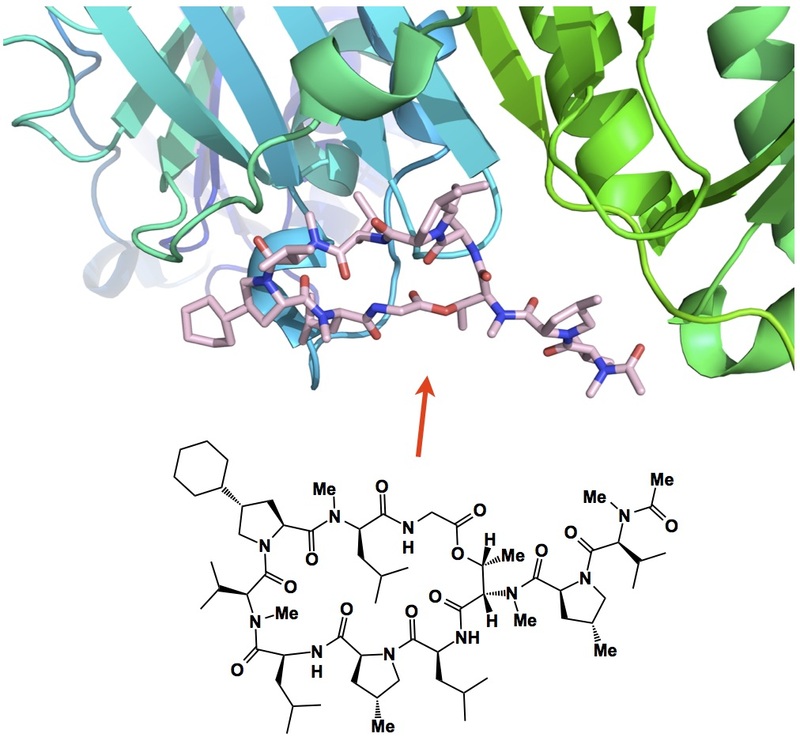 Now Rolf Müller of the Helmholtz Institute for Pharmaceutical Research in Saarland and researchers at Sanofi-Pasteur report in Science on the derivatives of GM with excellent anti-tuberculosis potential. Surface plasmon resonance has revealed DnaN (the sliding clamp of DNA polymerase) to be the target of this molecule. What’s most interesting is the effect of proline alkylation on the stability of GM. Apparently, proline-8 was identified as the locus of metabolic liability, which triggered the search for more stable versions of GM. Simple structural modifications led to metabolically stable compounds with increased lipophilicity and oral bioavailability of up to 89%. A crystal structure of the cyclohexyl GM-DnaN complex was determined, showing that one of the peptide-binding pockets of DnaN had been occupied by the cyclic part of the ligand. I continue to marvel at how some minute structural changes lead to profound consequences in the activity of cyclic peptides. And please don’t tell me that biological methods (phage display, you name it) are better than rational design based on logical arguments. This paper is a great example of the synthetic approach. Now let’s consider someone who has just made a truly thought-provoking discovery. Here is a question that interests me: how often have others passed by that observation and did not even think twice about its significance? One can probably say that the predecessors might not have had the right tools, which would explain why the discovery had eluded them. I think this is very understandable. But then there is another possibility: people might have had all the tools in the world to make the discovery, yet they really did not care about it as their primary objective was in a totally different field. This could happen if we consider different areas that are driven by unrelated objectives. Take, for instance, polymer chemistry on one hand and synthetic methodology that targets small molecules on the other. Here is one of the cases from my “vault” of papers from 20 years ago. Below you see a link to the classic paper by Leigh and co-workers in Angewandte. It details the first crystallographic characterization of the smallest known catenane. If you consider the reaction that leads to the synthesis of this molecule, I am sure you will agree that things cannot get much simpler. In fact, the authors themselves state that the reaction involves “chromatography-free purification procedure simple enough to be performed in a well- equipped high school or undergraduate laboratory”. Now just think about the number of times polymer chemists studying amide materials made this catenane prior to 1995. There is substantial peer-reviewed and patent literature that documents formation of insoluble white powders during polycondensation. According to those reports, the precipitates are to be discarded upon work-up… I am sure there are many examples like this in other areas. It is indeed rather easy to pass by something exciting and not even notice it.